Looking for a good value in a solid fly fishing reel? Compiled here is a list of the best brands and varieties of fly reels available, shown in a classic 4-6 weight range. (Read more about “weight” here) Not only are these the best brands, but they are also the best fly fishing reels under 200 dollars, making them incredible values for the reviews and feedback they have received all around the web, from novices to pros. If you are just looking to get started with fly fishing, or are looking to upgrade reels without breaking the pocket book, this list is for you. The great thing is, these are not low end reels at these prices and should last a long time with good care. Below is more information about each individual reel. With the help of this guide, you can choose the best fly reel under 200 that best fits your needs. And then its time to fish on! Check out our guide on the Best Shimano Spinning Reel for 2019! The Sage 2200 series is a series comprised of 4 different reels, a 3/4 weight through 9/10 weight. The one we showed in the specs is the 5/6 weight, known as the 2250 model. This model is one of the biggest ones we reviewed, with a diameter of 3.625″ and a width of 1.3125″. This means it is also a bit on the heavier side at 5.25 ounces. Depending on the length and weight of rod you use, this could be a positive as it can help balance your rod evenly. Because of it’s size, this reel also has rave reviews about how large the handle is, making it very easy to grip. This reel is very simple to switch from right to left hand or vice versa. It’s drag system is also a cinch to use as it is numbered so you always know where it is at, and it is very simple to adjust. The sealed carbon drag system makes this a quiet, smooth drag to use, as well as very durable. The Sage warranty cannot be beaten, with a lifetime warranty placed on each and every reel. Let them know if you have any issues and they will be happy to assist. 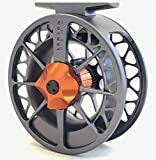 All in all, at only $139 dollars, this reel is a solid buy from a brand name that is well-respected, trusted, and stands behind their products, as long as you don’t mind the bulkiness – some may actually prefer this. Our choice for the best fly fishing reels under 200 is an American-made beauty. The Waterworks Lamson Guru is machined in the USA and assembled in Idaho, in the heart of fly fishing country. This large arbor reel is designed to be strong but yet lightweight, being the lightest among our reels. This is one of Waterworks cheaper reels, yet many say it is similar to their high-end reels in quality and durability. With a fully sealed drag system, you don’t have to worry about sand or water interfering with your reels performance. In fact, their drag system they use in this reel is the same drag they use in their far-more expensive reels. The Guru is also very simple to change from right to left. The one knock on this reel is the size of the handle – for those with large hands, it may be uncomfortable to use due to its small size. However, at $144, for the rest of us, it could be the reel to last a lifetime – literally, as they also have a lifetime warranty. If you like to support American-made and love a smooth drag, this is the reel for you. Size 2 is designed for rod weights 5-6. The unique design of the Behemoth is eye-catching and adds a sleek and modern look to your rod. Not only is this reel attractive, it is also highly functional at an outstanding price point of only $110. This has an oversized drag knob to make it easy to switch quickly, along with an ergonomic handle that is good sized as well. This reel is the biggest here at 5.6 ounces and a 3.6 inch diameter! With it’s wide design, this reel can hold a lot of backing – 125 yards of 20 pound line to be exact. This reel is big and powerful, as well as smooth, with a carbon fiber drag. This reel also easily switches between right and left handed. The only knock would be it’s size – if you are looking for a small reel, this isn’t it. However, if you want a big, sleek, attractive reel with oversized features for those with larger hands, this is your reel. This also comes with a lifetime warranty, so fish away! The highest priced out of these five reels, the Ross CLA is that way for a reason. This reel is designed for use in freshwater AND saltwater through anodization. Because of it’s anodized finish, this reel is tough and durable against scratches and dings. In order to hold up against saltwater, it’s drag also must be tough and sealed. This one also sports an oversized drag knob for easy adjustment. You’ll be hard pressed to find any knocks on this one, as it has a buttery-smooth drag, is very durable, and performs excellently. Though it is the most expensive out of these five, this reel is still a great price for fly reels while still delivering quality. These are also eligible for a lifetime warranty and are also made in the USA. For just under 200 dollars, this is a great buy. Anyone of these five reels are great candidates for the best fly fishing reels under 200 dollars. As you can see, it is merely a game of minute differences and preferences when trying to select from the best fly fishing reels under 200 dollars. Feel free to click on any image to head over to Amazon and read the reviews about them. Thanks for reading, and hopefully this helped you choose out a decent priced, yet quality, fly fishing reel!